After a dominant and record-setting week at the plate, Bob of Loss Mitigation was named Wiffler of the Week for the eleventh time in his EWL career. 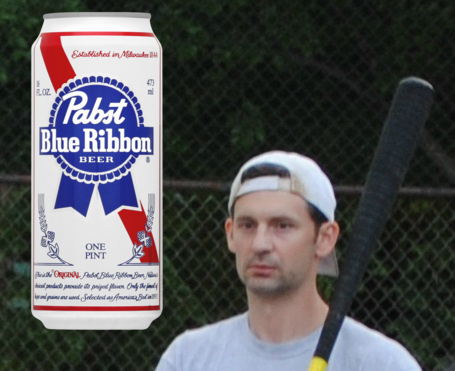 After a record-setting week that included a historic performance that tied the single-game home run record (5) and broke the single-game total bases record (28), Bob of Loss Mitigation was voted the Pabst Blue Ribbon Wiffler of the Week for week 3 of the 2018 EWL season. Bob went 14-for-21 on the week with a single, four doubles, three triples, six home runs, an incredible twelve runs scored and thirteen runs batted in. His bat was unstoppable as Loss Mitigation pounded Cheap Goats and also defeated Shady Characters in a dramatic, come-from-behind win. After a relatively pedestrian start to the season, by his standards, Bob’s bat took off as many have come to expect from the four time EWL Wiffler of the Year, and he carried his team to two big victories that propelled them to first place in the EWL standings. This is the 11th time Bob has earned Wiffler of the Week honors, and the first time since week 6 of the 2017 season. Loss Mitigation has now earned all three Wiffler of the Week awards for the 2018 season so far, after Bob’s teammate, Mike, was named Wiffler of the Week for weeks 1 and 2. This is the first time since 2012, and only the third time ever, that players from the same team have been named Wiffler of the Week more than two consecutive weeks. Ivan (twice) and Vassallo of the Fish Sticks won Wiffler of the Week in three consecutive weeks in 2012, and Ron, Morrison, Frosty, and Les (twice) of the Caucasians won Wiffler of the Week in five consecutive weeks, also in 2012.